The Overtones have confirmed that their band member Timmy Matley has passed away at the age of 36. The vocal harmony group - consisting of Lachie Chapman, Mike Crawshaw, Darren Everest and Mark Franks - revealed on Twitter today (April 11) to confirm the “heartbreaking” news. They wrote: "It is with the greatest sadness that we have to announce that our dear friend and brother Timmy has passed away. We know this news will be as heartbreaking for you all as it is for us. "We appreciate your love and support at this difficult time. Mike, Darren, Mark & Lachie x (sic)"
The cause of death has yet to be officially confirmed. Matley had been diagnosed with stage three malignant melanoma after finding a lump under his arm two years ago. He was due to complete a skydive to raise money for the hospital where he received treatment, The Royal Marsden in London, in May after raising thousands of pounds via JustGiving. In a statement, the singer's agent told the BBC: "Singer Timmy Matley died suddenly in London on the 9 April 2018. The Overtones singer, from Cork, Ireland, was 36 years old and lived in London. No further details are currently available. "Family and friends are devastated at the news and have requested privacy at this very difficult time." He joined The Overtones in 2010, and they have scored four top 10 albums in the UK. 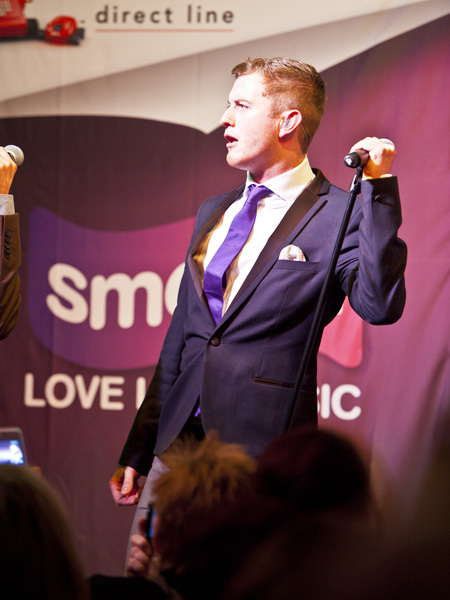 The Overtones have performed at various Smooth Radio Love Life Music Events gigs over the years, including shows in Glasgow, London, Liverpool and Manchester.